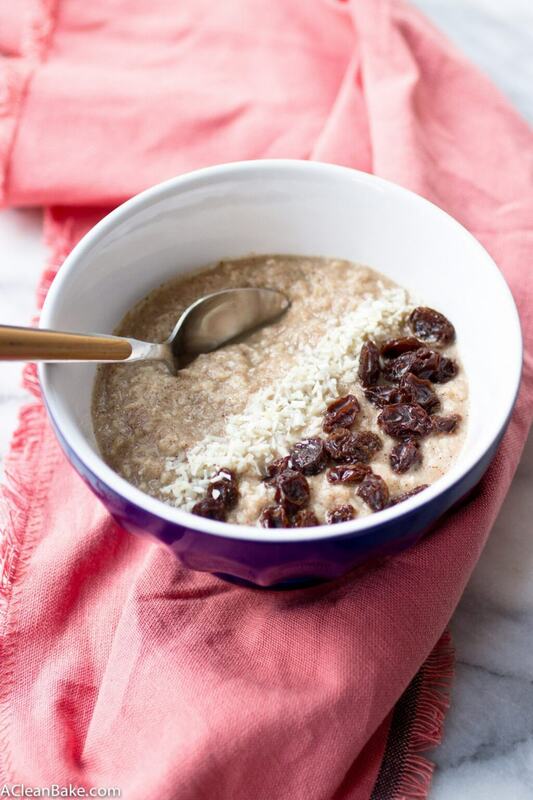 Grain free hot cereal takes 3 minutes to make and it fills you up and warms your belly just like oatmeal – but without the grains! When the weather is warm, it’s easy to eat quick, grain-free foods, especially for breakfast: hard boiled eggs and cut veggies are a great way to start the day (the Turks do it right, don’t they?). But the cold weather makes it tough enough to coax yourself out of bed, and the only thing that makes you believe you can ever be warm again is the promise of a belly full of warm, hearty food. Like, I suspect, many health-minded people who now don’t or can’t eat grains, I used to eat oatmeal every single day for breakfast. Sometimes for dessert, too, loaded with chocolate chips, raisins and walnuts. It’s a nutritious, cheap and versatile food that makes for a really comforting and warming winter breakfast. And I still haven’t forgiven my body from deciding it was too good for the humble oat. I created this grain free hot cereal specifically to replace oatmeal and the feeling of cozy satiety that comes with every bowl. It’s quick and easy to make, which is lucky because the major drawback is that it is not a very good make-ahead option – it will spoil after two or three days in the fridge. But don’t worry: it is easy enough to make when you need it, even if you don’t have much time to spare in the morning (I feel you there, friends). 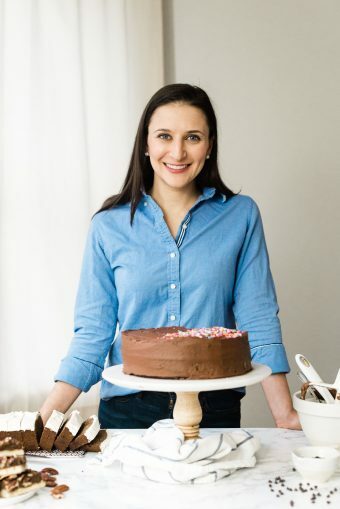 And, on that note, I am going to stop talking about this grain free hot cereal – which I love to call fauxtmeal – so that you can go make a bowl before you head off to tackle your day! PS: I have two more variations on this recipe coming to you tomorrow and Thursday, so that you can start your mornings right! Grain free hot cereal takes 3 minutes to make and it fills you up and warms your belly just like oatmeal - but without the grains! In a microwave-safe bowl, mix together the coconut flour, shredded coconut, cinnamon, salt, and sweetener. Add the vanilla and milk and stir until no clumps remain. It will be very runny (don't worry; it will thicken up). Microwave on high for 45-60 seconds. Stir and microwave another 30-60 seconds until it reaches your desired temperature. If it has thickened too much, stir in the remaining 1-2 Tablespoons milk until it thins out to your preferred consistency. Taste, and adjust sweetener if desired. Top with dried fruit, chopped nuts, and/or shredded coconut if desired and serve immediately. This recipe, as I'm sure you can tell from the ingredients, is very hearty. Feel free to make a half recipe, or share the full recipe, if this is too much for you. 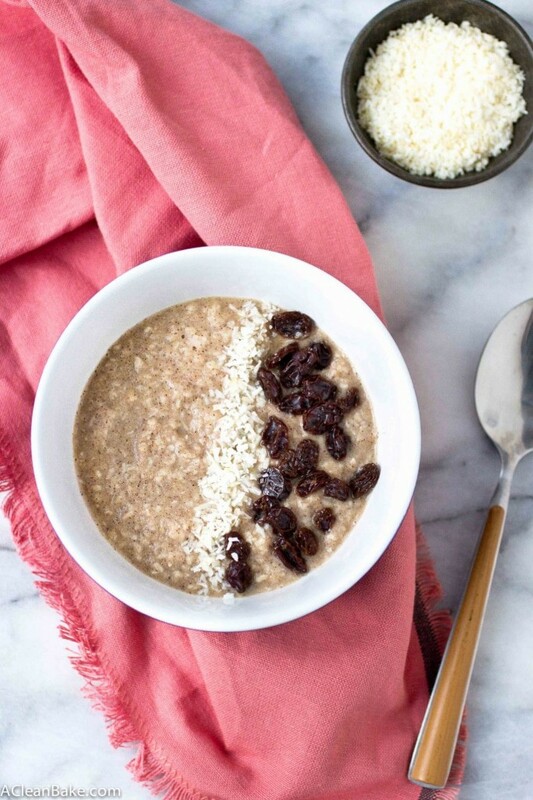 This hot cereal is best consumed immediately after making it. It spoils quickly, and should not be made ahead if you can avoid it. Omit the sweetener to make this Whole30 compliant. It’s such a great winter morning breakfast! Stay warm yourself! I hate winter!!! 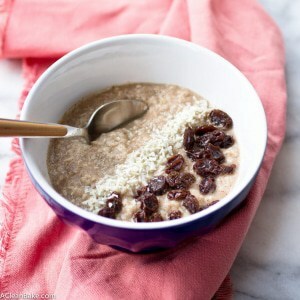 Coconut is my fave- love this grain-free warm cereal! Nora this looks soooo warm and comforting! The promise of these Fauxts (love that name!!!) will be only thing getting me out of bed over the next few days. How do we make this without the microwave? That’s a great question, Tonya! I’ve never tried it actually, but I think it should work if you were to make it on the stove in a small pan just stirring constantly over low/medium heat until the mixture thickens. Let me know how it goes!